Mud glorious mud ! scavengers are finding treasures on our riverbanks. 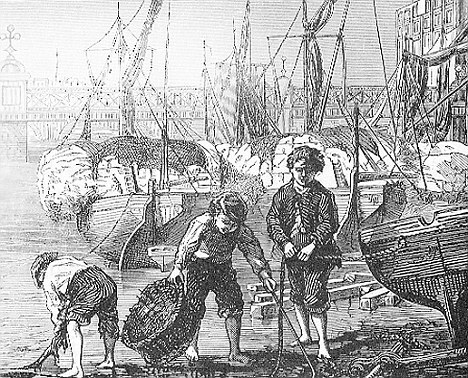 Take a stroll along the bank of the Thames by the City of London at low tide and, chances are, you'll see a man prodding around in the mud with an old garden fork and a spade. Occasionally, you'll see him scoop out a gunge-covered scrap and gently lay it in his bucket. Harmless eccentric, you might think, but you'd be wrong. Sometimes, the Thames reveals some extraordinary oddities. Most recently, it was a 17th century prisoner's ball and chain, discovered by one of the river's treasure hunters - or mudlarks. There was no sign of the prisoner who once must have worn it, but it caused a flurry of excitement among those who specialise in uncovering the river's long-lost treasures. Anthony Pilson knows better than most that there's more to the muddy Thames than meets the eye. Over the past 30 years, Anthony, 76, has plucked thousands of treasures, worth hundreds of thousands of pounds, from the river's silt and clay. And now, in an unprecedented act of generosity, this humble man - home is a bedsit in Hampstead, North London - has handed his collection, delivered in a suitcase, holdall and plastic bag, to the Museum of London.